Death knell for professional cycling? What about the cancer research? Re: Lance Armstrong Gives Up? If there was ever an athlete I admired and wanted to believe in, it was Lance. Does this refusal to continue his fight diminish that belief, well a little, but I will still support his cause which has helped so many. As a cancer survivor, I know the positive powers of people sharing their energy, strength, and positive beliefs. Lance Armstrong and the foundation he created have created much of that energy (and money) for countless survivors. If the charges of doping are true, I'm disappointed, but I cannot overlook the good that Lance has done for so many. So... Lance gets stripped of the titles, but really who else can you give it to if EVERYONE WAS DOPING?? It is sad. 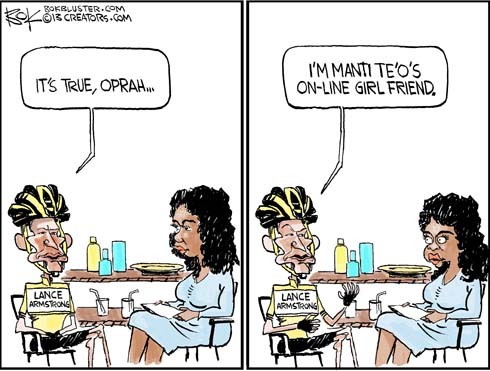 I´ve defended Lance for so long, and there´s always that emotional pull that tells you philosophically that if it would be okay for someone to do doping it would be the guy who has cancer. But, the more I read about the story and hear about the things that were said on ¨60 Minutes¨ and the other sources of information, the less sympathy I have. I mean if you allegedly take drugs to both improve your VO2 max (oxygen capacity) and improve your muscle tone/strength and encourage offering false blood samples to other US team members, well, at the end of the day it just ruins the sport. At least 2 witnesses said he did these things...even if they were doping themselves--Floyd and Hamilton. I´ve got no sympathy anymore... Proof from witnesses is as strong of evidence as failing a drug test. The word that stands out on the yellow piece above is ¨Defiance¨ now. Now, if we could just see the same terms used for the mail system. Nike does not condone the use of illegal performance enhancing drugs in any manner. Well then... how do you explain this?? 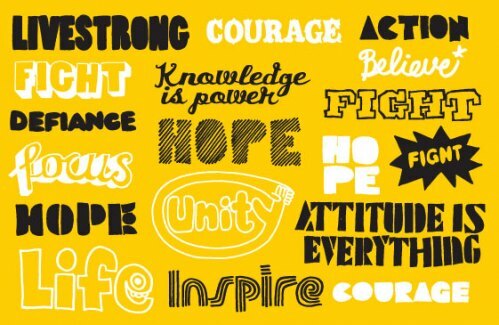 2) Nike is also doing the right thing by continuing to support the Livestrong initiatives created to unite, inspire and empower people affected by cancer. 3) It is good Lance is stepping down as chairman of Livestrong, but he really needs to resign from the board of directors also....too many distractions with him on the board, and he doesn't need to be a board member to continue raising money for the foundation. Is there no where a young person can turn to find their heroes anymore? It all starts at home, parents. But they will allow guys with doping suspensions to hang out in their VIP tent at the track trials. Ah yes, Mark Block....Carmelita's former agent, as I recall. They no doubt would plead ignorance. Or blame their coaches. Or say they were victims of jealous rivals who spiked their water bottles with banned substances, or claim that the liquid they had been squirting under their tongues was only flaxseed oil, not performance-enhancing drugs meant to turn them into rockets. They would blame anyone but themselves. But that’s only if they could talk — which they can’t. That is because the latest doping scandal in sports does not involve Tour de France-winning cyclists or All-Star third basemen or Olympic sprinters. This one is about birds. The world of pigeon racing was rocked to its core this week — no joke — when six Belgian birds failed tests for banned performance-enhancing drugs. The excerpt is precious . . .